Every cat is unique and special, so every cat sitter should be too! At Pawshake, we pride ourselves on our network of loving cat carers who will dote on your furry friend as much as you do. 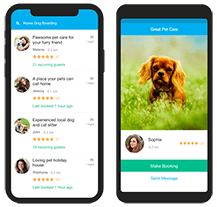 Whether your cat would prefer to stay at home or at the cat sitter’s house, there is a cat sitting solution for every fussy feline on Pawshake. What is the best cat sitting service for my cat? As all cat owners know, cats can be very fussy about their environment and the company they keep. Many cats become stressed if they are transported to an unfamiliar place, whereas others might be relaxed around new people and places. Pawshake offers flexible cat sitting choices for all fussy felines. If your cat is a little shy and would prefer to stay at home, arrange a cat feeder to stop by once or twice a day with drop-in visits. This is also a good option if you are working back late, or going away for one or two days. If you are away from home for a longer period, house sitting includes cat sitting as well as keeping a close eye on your home. Not only will your furry friend have friendly company throughout the day and night: your home will remain secure and lived-in. For more adventurous felines, home boarding might be an option to consider if your cat would be comfortable staying at a cat sitter’s house. Why is cat sitting a better solution? Cats are very sensitive to the space around them and the sights, scents and sounds that come with this. A cattery or traditional cat boarding facility can be a very stressful experience for some cats, who might not enjoy the constant activity around them in these places. Whether your cat stays with a friendly cat sitter or relaxes in their own home, you know a Pawshake cat sitter will give them the one-on-one care and attention they deserve. We accept only the most responsible and dedicated cat sitters onto Pawshake - in fact, a mere 20% of cat sitting applicants make it through our review process. Plus, you can relax knowing your cat is covered by our Premium Pet Protection insurance throughout the cat sitting booking. Find the perfect cat sitting solution by searching for your suburb on the Pawshake website or mobile app. Browse through our many local profiles, read past reviews from happy cat owners and check your sitter's availability on their calendar. Cat sitting is a true passion for our cat sitters, never a chore! Many cat owners might feel guilty for relying on friends, family or neighbours for cat care. Pawshake cat sitters genuinely love cuddling cats and want to help you: it’s a win-win! Is your cat a little older, or in need of daily medication or other special care? Many of our cat sitters can perform specific tasks upon request, including grooming, administering medication and even cat first aid. Of course, you dearly miss your cat when you aren’t close to them: but you can delight in seeing them pampered and happy in photos and message updates from your cat sitter throughout the booking. Using Pawshake cat sitting for the first time? With these simple steps, you can be sure your cat sitter will do the best job they possibly can for your feline friend. Take your time in looking for a cat sitter by browsing through a few sitter profiles first. When you see a profile you like, read about the cat sitter’s previous experience, previous reviews and availability on their calendar. Send the cat sitter a quick message with your cat sitting requirements. If they are available for the specified period, arrange to meet and greet with your chosen cat sitter and, of course, introduce them to your furry friend. Ask the cat sitter plenty of questions about their experience and tell them all about your cat’s personality and cat sitting needs. If your cat is purring and you feel great about the cat sitter, simply visit the Pawshake website again to officially book and pay for their cat sitting services. By doing this, you will ensure your cat is covered by our Premium Pet Insurance and Pawshake Guarantee throughout the cat sitting booking.